There's a good reason why Kauai is often referred to as the Garden Isle: This beautiful island is largely covered with lush greenery and tropical plants. 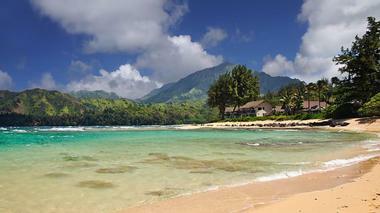 As the oldest and arguably the most beautiful of the main Hawaii islands, Kauai offers something for everyone. 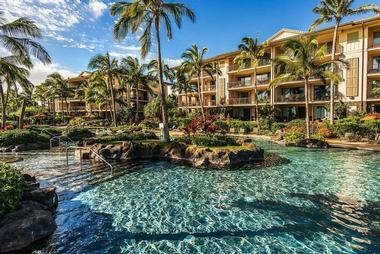 Luxurious resorts with sparkling oceanfront pools line the eastern shores, while the more remote parts of the island offer jaw-dropping waterfalls, colorful coastal cliffs, and the stunning Waimea Canyon. Everyone should experience the unparalleled beauty of Kauai at least once in their lifetime, so here are the island's best beachfront hotels and resorts. Tucked away in a secluded cove on the north coast of the island, the St. Regis Princeville Resort is an elegant, upscale resort that offers a world-class spa, two championship golf courses, four excellent restaurants, and a state-of-the-art fitness center. Guests can choose from more than 250 luxurious rooms and suites; more than 90% of the rooms offer stunning ocean views, and all are furnished in a gorgeous contemporary Hawaiian style. A beautiful, 5,000-square-foot infinity pool sits overlooking the beach; complimentary fruit spears and chilled towels are provided, and private cabanas are available for rent. Roughly 1 mile away from the Poipu Beach Park, the Grand Hyatt Kauai Resort and Spa is a 5-star hotel with more than 600 guest rooms. The resort offers activities such as lei making, ukulele lessons, and a traditional luau, and there is an excellent selection of on-site restaurants and tropically themed bars. Guests can also get pampered in the 45,000-square-foot spa, enjoy a game of tennis on one of the resort's courts, take a dip in one of the indoor or outdoor pools, or break a sweat in the well-equipped fitness center, which is open 24/7. 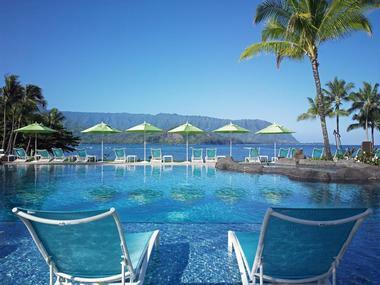 Nestled on 22 lush acres, Hanalei Bay Resort prides itself on its friendly service and excellent views of spectacular Hanalei Bay. The beautiful beach is only a 5-minute walk away, and a complimentary golf cart shuttle service is offered to guests 24/7. Surrounded by waterfalls and tropical gardens, the free-form lagoon pool is another great place to go for a swim; a second, smaller pool with a swim-up bar is available to adult guests. Both one and two-bedroom condos are available for rent, and larger, privately owned units can sometimes be rented directly from the owners. 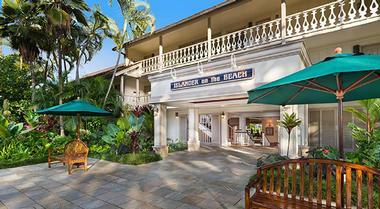 Tucked away on the eastern shore of the island, Aqua Kauai Beach Resort boasts 25 acres of oceanfront luxury. Everything you need for the perfect vacation can be found in the resort, including several excellent restaurants, live music and entertainment throughout the day, a fitness center, four swimming pools with waterfalls and a waterslide, and a spa offering massages and other beauty treatments. The centrally located resort is also a great place to base yourself if you're interested in taking some day trips around the island; the forested northern mountains and the beautiful Waimea Canyon are within easy reach. 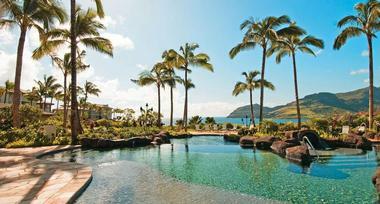 Breathtaking views are the order of the day at the Alii Kai Resort, which is perched on a bluff overlooking the ocean. The resort offers weekly stays in its fully furnished two-bedroom, two-bathroom condos, which can accommodate up to six people. A wide variety of activities are offered, including snorkeling and scuba diving, surfing, ukulele classes, traditional lei-making lessons, and yoga sessions. If you're more interested in relaxing, in-room massage services are offered as well. The resort staff are happy to help you plan your perfect vacation, and a complimentary breakfast and orientation session takes place every Sunday morning. Encompassing six beautifully landscaped acres on the Coconut Coast, Aston Islander on the Beach is an intimate hotel located right on the waterfront amid the palm trees. The plantation-style thatched huts boast hand-carved furnishings, rattan furniture, well-equipped kitchenettes, and patios or balconies, while the beachfront common area offers guests a large pool, a hot tub, several barbecue areas, and a poolside bar with a daily happy hour and live music twice a week. 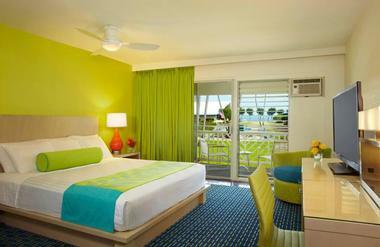 Rooms come with either a garden view or an ocean view, and a free shuttle is offered to and from the airport. 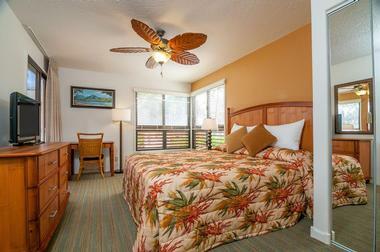 Located minutes away from the airport and only a block away from well-known Kalapaki Beach, the Banyan Harbor Resort offers one-bedroom apartments and two-bedroom townhouses. The tropically furnished condos all include living rooms, private balconies with stunning views, well-equipped kitchens, and dining areas, while the resort's outdoor amenities include a heated pool and barbecue areas. A wide variety of shops and restaurants can be found within a 2-mile radius, and guests can also head to the nearby Kalapaki Beach to swim, sunbathe, participate in water sports, or take advantage of the tennis and shuffleboard courts on the beach. Offering cozy studios and family-friendly one-bedroom apartments, Castle Mokihana is a value-oriented hotel located on the sunny Coconut Coast. All rooms have private patios with ocean views and kitchens or kitchenettes; guests are also welcome to use the outdoor barbecue areas, and anyone who wants a break from cooking can enjoy a meal at the on-site steakhouse. The oceanfront pool makes it easy to stay cool, while the on-site putting green, shuffleboard courts, and basketball hoop ensure that guests will never get bored. Free Wi-Fi is offered in the lobby, and free parking and coin-operated laundry machines are available. 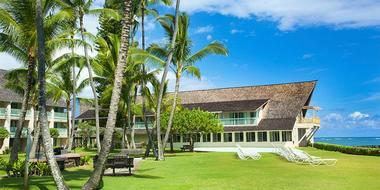 Situated right on the ocean, the Courtyard by Marriott Kaua'i at Coconut Beach is a modern resort with a private beach for guests to enjoy. A beautiful outdoor pool surrounded by sun loungers is available if you're not interested in taking a dip in the ocean; other amenities include a games room with an air hockey table, an outdoor courtyard with hammocks, a fitness center, and a fully serviced day spa. 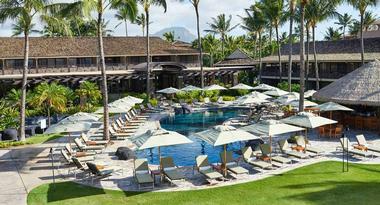 The on-site restaurant and bar prides itself on offering local food and drinks, and guests are encouraged to join in the nightly luau to get a taste of traditional culture. As the only resort on Kauai's remote north shore, the Hanalei Colony Resort offers the opportunity to truly escape from the hustle and bustle of modern life. The resort sits on 5 acres of beautifully landscaped tropical gardens complete with water features, and it offers an on-site spa, three unique food and beverage outlets, and a luxurious pool area with a hot tub. A complimentary shuttle to nearby towns and some of the north shore's most magnificent attractions is available to guests, and free parking is offered at the resort for those who prefer to drive themselves. 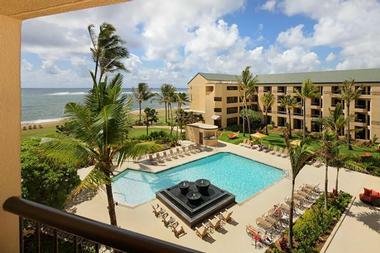 Conveniently located right next to the family-friendly Lydgate Beach Park, the Hilton Garden Inn Kauai Wailua Bay boasts a beautiful beach with a protected swimming lagoon. The resort is close to a number of waterfalls, parks, and cultural attractions, and 2-hour bike rentals are included in the resort fee. The on-site ocean view restaurant is open for breakfast, lunch, and dinner, and the resort also has a 24-hour market for guests who get hungry when the restaurant is closed. 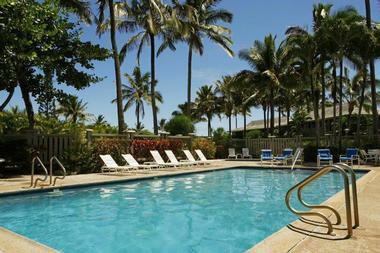 Free Wi-Fi is available in all public areas, and resort amenities include two pools, a hot tub, and a fitness center. 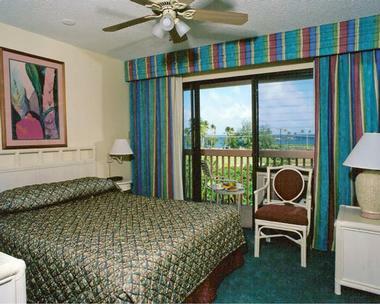 Established in 1956, the Hotel Coral Reef is proudly located right in the heart of the quaint Kapa'a town. Located right on the beach, the hotel offers stunning views of the water as well as a beachfront pool with a tropical waterfall and a hot tub. A complimentary continental breakfast is offered every morning, and the hotel is happy to provide its guests with complimentary use of its bicycles as well. Oceanside massage services are available for a fee, and other amenities include a gym, a sauna, complimentary parking, a gas barbecue, and free Wi-Fi in all guest rooms and in the lobby. 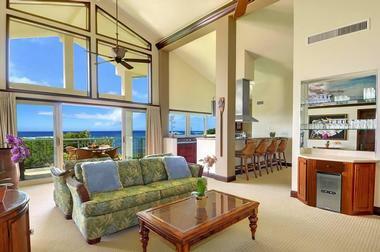 Sitting on a peaceful beach in Lihue, Kauai Beach Villas offers weekly one and two-bedroom condo rentals. All units include private lanais and full kitchens, and all are non-smoking and accessible only by stairs. The beach is only steps away from the condos, and guests are also free to take a swim in the outdoor pool or relax in the hot tub. Tennis courts are available for anyone interested in getting some exercise, and the hotel's convenient location on the east shore means that a variety of restaurants, parks, golf courses, and shops are only minutes away. 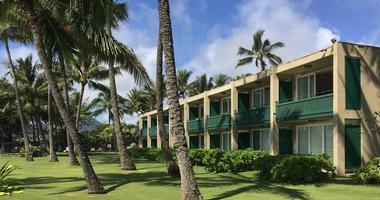 Surrounded by swaying palm trees on the east side of the island, the Kauai Coast Resort at the Beachboy is a timeshare resort situated on 8 beautiful oceanfront acres. The family-friendly resort offers four picnic areas with barbecues, a lounge area with hammocks, a beachfront hot tub, and two pools, one for children. A poolside bar serves drinks and light meals, while the on-site restaurant is open for dinner Tuesday through Sunday. Other hotel amenities include free outdoor parking, complimentary Wi-Fi, and an exercise room; a wide range of oceanside spa treatments are available for an additional fee. 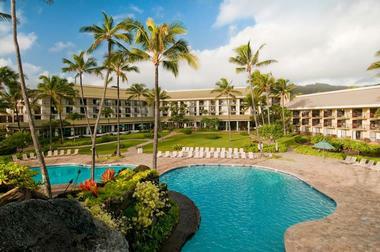 The only resort on Kalapaki Bay, the Kaua'i Marriott Resort is an excellent destination for a relaxing tropical retreat. The resort boasts one of the largest family-friendly pools in all of Hawaii, and is conveniently located right next to the acclaimed Hokuala Golf Course. A full-service spa and a selection of six on-site restaurants make it easy to relax at the resort, and guests can take advantage of services like boat rentals, surf lessons, and a children's activity club. The hotel also offers almost 28,000 square feet of event space, making it a great choice for anyone planning a wedding or other special event. Formerly known as the Kauai Sands Hotel, the Kauai Shores Hotel is located only 2 miles away from the beautiful Nonou Forest Reserve. Complimentary outdoor yoga classes are held every morning, and the resort fee covers parking as well as the use of beach towels, lounge chairs, and the two on-site pools. The hotel is also proud to be home to the unique Lava Lava Beach Club, which offers live music every evening and is one of the only restaurants on the island that allows guests to enjoy their meals with their toes in the sand. 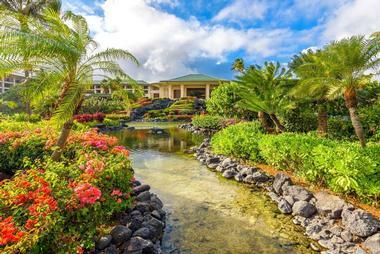 Situated right on Poipu beach, Kiahuna Plantation & The Beach Bungalows boasts 35 acres of lush landscaped lawns and tropical gardens. The plantation-style one and two-bedroom condos allow guests to truly experience the feel of old Hawaii, but they all offer modern amenities like full kitchens, complimentary Wi-Fi, and HD cable TV. Guests can choose from either garden view or ocean view condos, and communal amenities include a heated pool, several barbecue areas, a fitness center, and tennis courts. Beach towels and chairs are available free of charge, and other beach equipment can be rented for a fee. Located not far from the southernmost point of the island, Ko'a Kea Hotel & Resort at Poipu Beach is a chic oceanfront resort that was named Travel + Leisure’s Best Resort in Hawaii in 2017. 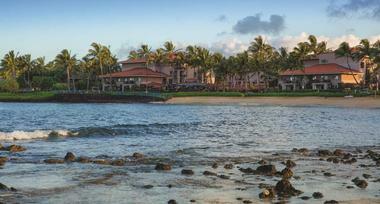 Guests can choose from 121 luxurious rooms and suites, some of which offer unobstructed views of beautiful Poipu Beach. Beach equipment can be rented from a small hut on the beach, and guests are welcome to take advantage of the heated ocean view pool and the convenient poolside bar. The gorgeous oceanside spa cabana offers indigenous services, and in-room massages can be arranged upon request. 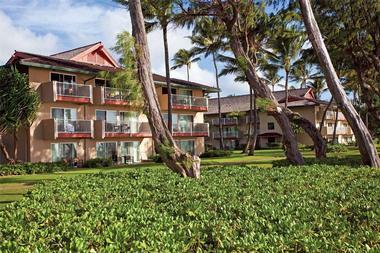 Tucked away on 25 acres of tropical gardens, Koloa Landing Resort is only half a mile away from the beach. The resort boasts three luxurious pools, including an intimate tranquility pool surrounded by cascading waterfalls and a large, family-friendly lagoon-style pool with a children’s swimming area. The poolside Holoholo Grill is the perfect place to enjoy dinner, and live music is offered in the lobby bar several evenings a week. If you're planning to enjoy a longer stay, the resort is also conveniently located only 5 minutes away from the many excellent restaurants found in Kukui’ula Village. 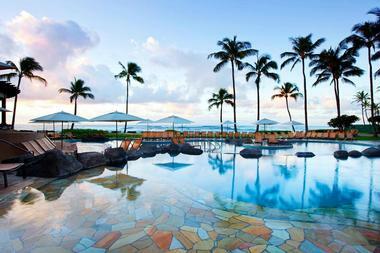 If you're looking for a truly premium vacation experience, Marriott's Kauai Lagoons - Kalanipu'u will deliver. The luxury resort is situated on over 500 acres of beautifully landscaped lawns and gardens; amenities include a large pool with a hot tub and sauna, a golf course designed by Jack Nicklaus, and a modern fitness center. The resort is located only minutes away from some of the island's most popular beaches and attractions, including Waimea Canyon and Fern Grotto, and the hotel staff are happy to help you arrange hiking trips, snorkeling excursions, and even tours of the island by helicopter. 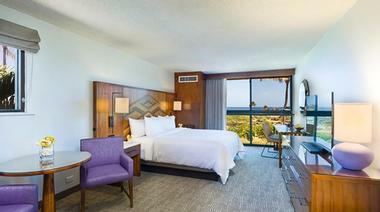 Less than a 10-minute walk away from Poipu Beach Park, Marriott's Waiohai Beach Club features a selection of beautifully furnished guest rooms and two-bedroom villas. Free Wi-Fi is offered in all rooms, and villas include fully equipped kitchens, oversized soaker tubs, and laundry machines. The hotel is happy to offer a beachfront Hawaiian restaurant and a casual cafe, and other amenities include three pools, five hot tubs, a game room, a fitness center, and beachside spa cabanas. An onsite playground makes it easy to keep children entertained, and the resort is proud to offer a variety of family-friendly activities. With its spacious, plantation-style one and two-bedroom condos, Poipu Kapili Resort is an excellent choice for anyone looking to enjoy all the comfort and privacy of home in a stunning tropical setting. All condos offer floor-to-ceiling windows, private terraces, and full kitchens; guests are also welcome to use the resort's barbecues and the community herb garden. 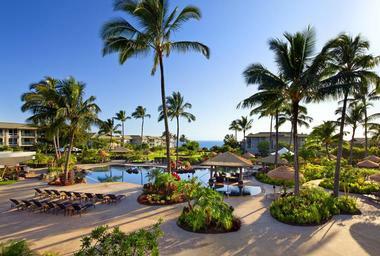 The resort offers a beautiful ocean view swimming pool, but guests will also be pleased to find themselves within walking distance of Kiahuna Beach and Koloa Landing. Free parking is available, and a daily housekeeping service can be arranged for an additional charge. The Sheraton Kauai Resort boasts an idyllic location on Poipu Beach, providing guests with easy and immediate access to the fine white sand and sparkling water of the Pacific Ocean. One of the resort's two pools sits overlooking the ocean while the other is tucked away in a serene garden; luxury poolside bungalows are available for rent at the oceanside pool. 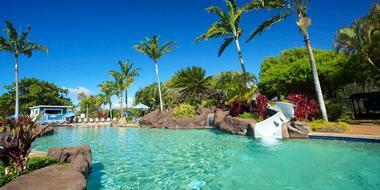 Complimentary towels are available for both pools, and other beach equipment can be rented for a fee. Yoga classes, hula lessons, and other activities are included in the resort fee, and the resort staff are happy to help guests arrange oceanfront bungalow massages. 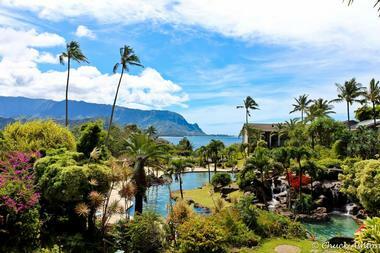 Set on a stunning cliff overlooking the ocean, the Westin Princeville Ocean Resort Villas encompasses almost 19 acres of breathtaking ocean view property. There are three whirlpool hot tubs and four beautiful pools for guests to enjoy, including two plunge pools, a large swimming pool, and a children's pool complete with interactive turtle fountains. The on-site restaurant serves lunch, dinner, and Sunday brunch, and a variety of daily activities are offered for guests of all ages. Both valet and self parking are available, and guests are free to take advantage of the complimentary shuttle to various Princeville Resort destinations. 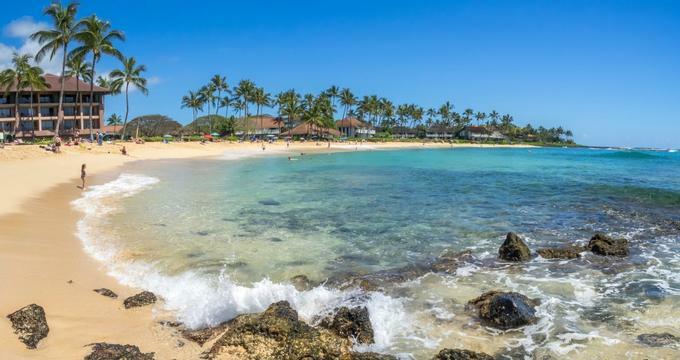 One of the island's most centrally located resorts, the Waipouli Beach Resort is the perfect place to base yourself if you're interested in exploring both sides of the island or in having easy access to a wide variety of shops and restaurants. However, there's plenty to keep you occupied even if you aren't interested in leaving the property; the resort boasts a heated lazy river pool with waterfalls and slides, a beachfront restaurant and bar, and a full-service day spa. Paved walking trails circle the entire resort property, and guests will be also pleased to have direct access to the Kauai Bike Path.